Anyone traveling for the 4th of July and needs ideas for occupying a tot? 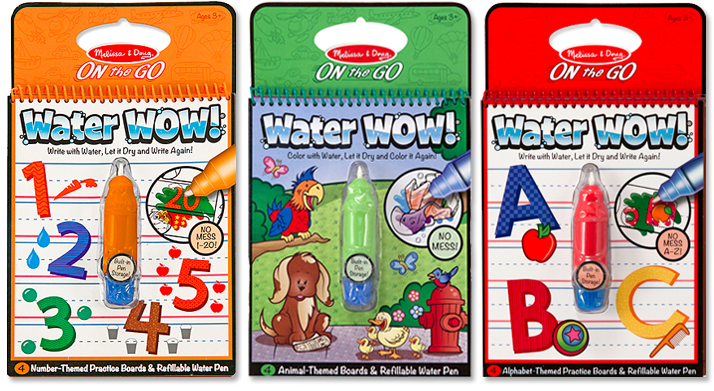 Well, check out these mess-free, yet engaging, Water Wow! 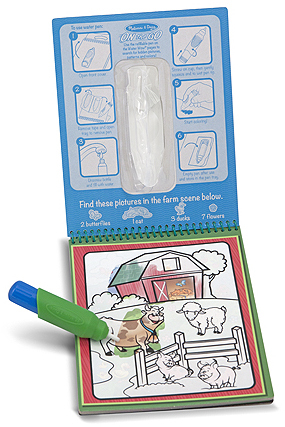 ON-the-GO activity books from Melissa & Doug. I just came across them at a local pharmacy, and they are the bee’s knees! In essence, they are coloring books. But, the magic is in the fact that you “color” with water. Each sturdy coil bound notebook comes with a nifty brush contraption that you fill with water. As soon as you glide the brush over the black-and-white drawings, they spring to life (and into color). And, when the water dries, the drawings go back to their original look and the fun can start all over again. I know, I know. This isn’t the one and only color-with-water product on the market. But, what I love about this line is how sturdy yet compact the books are, the fact that they come with the handy-dandy brush and do not require any additional pieces, that the brush stores away neatly inside a designated cover compartment when not in use, and that they are just so darn adorable! Here is an example from the ABC book. Here is an example from the Water Wow! Alphabet book (see photo on the right). Each page features letters of the alphabet – both capital and lower case – along with a “mystery box” that reveals it’s contents when “colored” in. You guessed it! The mystery drawing starts with the corresponding letter (eg: Ss paired up with a drawing of the Sun). Water Wow! 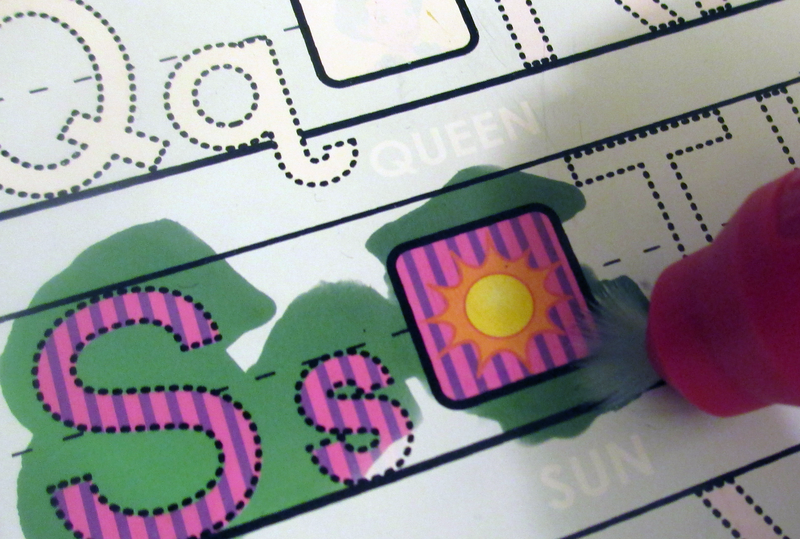 Numbers book has a similar set up, but instead of a single drawing of an object, the water brush reveals a corresponding number of shapes. The Water Wow! Animals, and Water Wow! Vehicles books are a little different. Each page shows a full black-and-white drawing that you color in with the brush. To learn more about the Water Wow! ON-the-GO books, visit the Melissa & Doug’s website. The activity books are recommended for ages 3 and up, but my almost-two-year-old does love them. Sure beats getting crayons or markers out of the car upholstery. PS. Or, while you’re at it, how about some ON-the-GO Pinball? Previous Post A Better Slice of Bread.